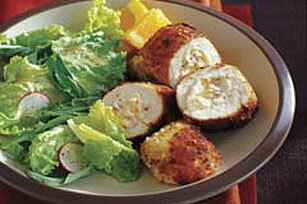 Serve our Stuffed Breaded Chicken recipe in just 40 minutes. With bacon, cream cheese and orange zest, our breaded chicken recipe is a guaranteed win! Place chicken on piece of plastic wrap on cutting board; cover with second piece of plastic wrap. Pound chicken with rolling pin to 1/2-inch-thickness. Wash orange, then grate the peel. Mix 1 tsp. of the orange peel with cream cheese and bacon until well blended. Spread 1 Tbsp. of the cream cheese mixture onto center of each chicken breast; roll up, folding in both short ends of each breast to enclose filling. Secure with toothpicks. Coat with bread crumbs; shake gently to remove excess crumbs. Melt butter with oil in large skillet on medium-high heat. Add chicken; cook 10 min. on each side or golden brown on both sides and cooked through (180°F). Place chicken on serving plate. Remove and discard toothpicks. Cut orange in half; squeeze juice over chicken. Let stand 5 min. before serving. Serve with a mixed green salad and slice of whole-grain bread. Out of bread crumbs? Prepare as directed, using finely crushed RITZ Crackers or saltine crackers instead. Substitute a lemon for the orange.